Meet Archie. 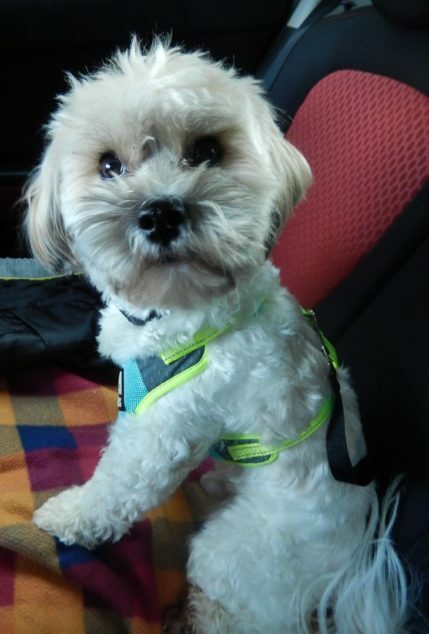 He’s an adorable Zuchon (Bichon Frise and Shih Tzu cross also known as a Teddy Bear dog). One thing I’m really enjoying about the featured dog interviews is learning about different breeds. Another is seeing how dogs inspire their human parents. Archie inspired his human mom to write a book to help first-time puppy owners. It’s a great book with lots of useful tips and information. See more about it below. Check out these fun facts about him as told by his human mom, Helen. Scroll down to see more photos of him. When my husband and I worked full-time we didn’t think it would be fair to get a dog, but when I went part-time at work we decided to go for it. We researched breeds. 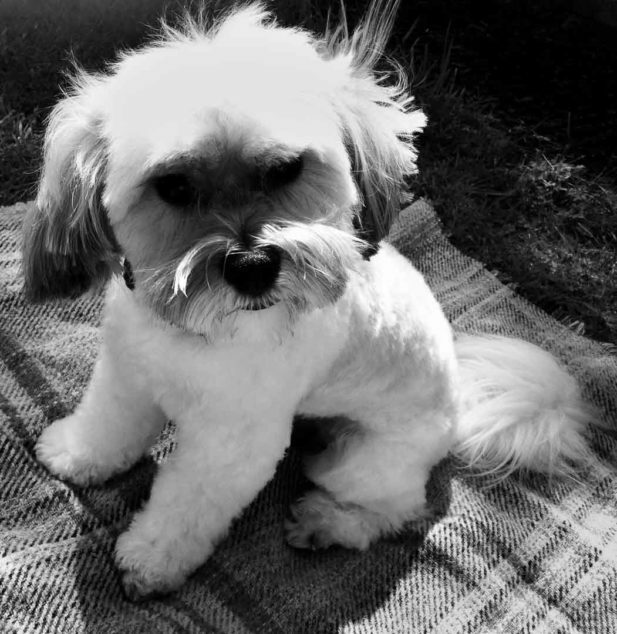 We wanted a small dog – one who didn’t shed much hair – and we liked the look of Zuchons (also called Shichons). We chanced upon an advert for a litter of Zuchon puppies not too far away from us – it was serendipity. As soon as we saw Archie we were smitten. Ah well, my husband and I are big fans of the old BBC series Monarch of the Glen (it’s off the air now but we have the box set). The main character in it, the Laird, is called Archie. If ever Archie (as in our Archie) does something we don’t like, e.g. rolling around in fox poo, we tend to call him Archibald! Anything fluffy – at the moment a blue monkey, but it could easily be one of my slippers if he’s being mischievous. 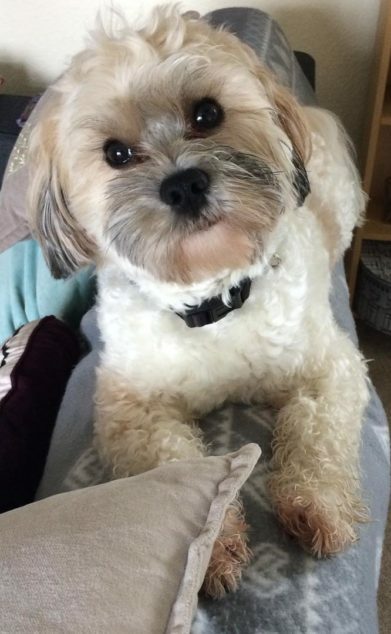 Archie loves a bit of cheese – chicken too. He also loves frozen peas for some reason. Comment from Archie: I do love a bit of bird poo! Archie gets picked up far more than he probably should, but I just melt when he looks at me. He sleeps in our bedroom (and very often on our bed). He never used to when he was a puppy, but when we moved house sleeping with us helped to settle him, and it’s a habit which has stuck. He gets new toys every time I go anywhere which sells them. I just got a water bowl personalized with his name on it. My husband carries him when he’s too tired to walk. Oh yes, very spoilt indeed. When he’s zooming around the garden, or when he’s rolling around on the sofa and tossing cushions around. The three of us play hide and seek – Archie loves coming to find us – he gets a treat too. 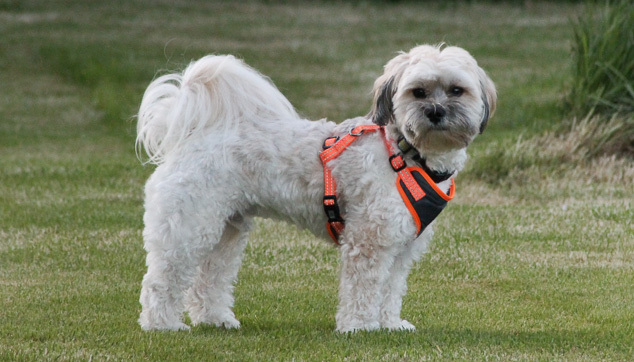 Comment from Archie: I run away when I see my harness coming out. It’s not that I don’t want to go out – I do, but Mum and Dad have to try and catch me first. It’s a great game! Archie’s now two. We got him when he was eight-weeks-old. I think it’s fair to say he was a shock to the system. We thought we’d done our research, but nothing prepared me for the anxiety I felt during those early days. I took it a day at a time and my confidence grew, and now I can’t imagine life without him. 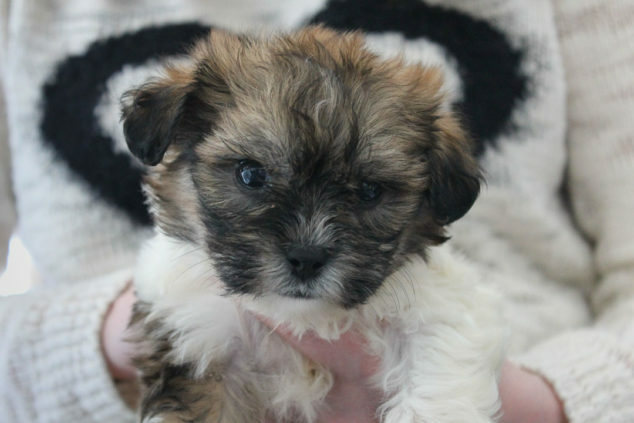 I decided to write a book about my experience of bringing up Archie, in the hope that it will help other first-time puppy parents who are finding the experience tougher than they thought. Archie as a puppy. What cuteness! Archie on a chair looking up with those sweet eyes. 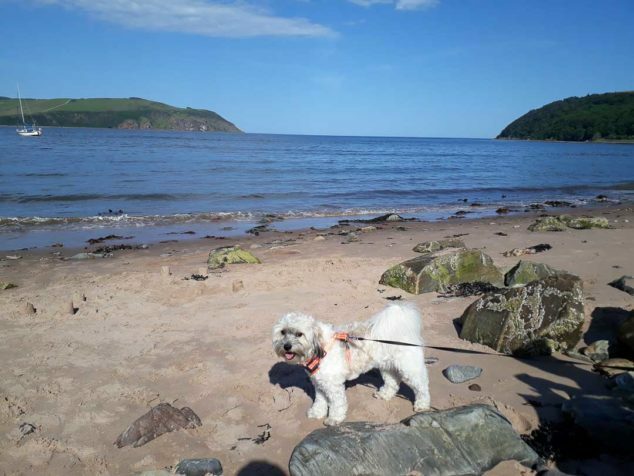 Many thanks to Helen for sharing the fun of your adorable dog, Archie! 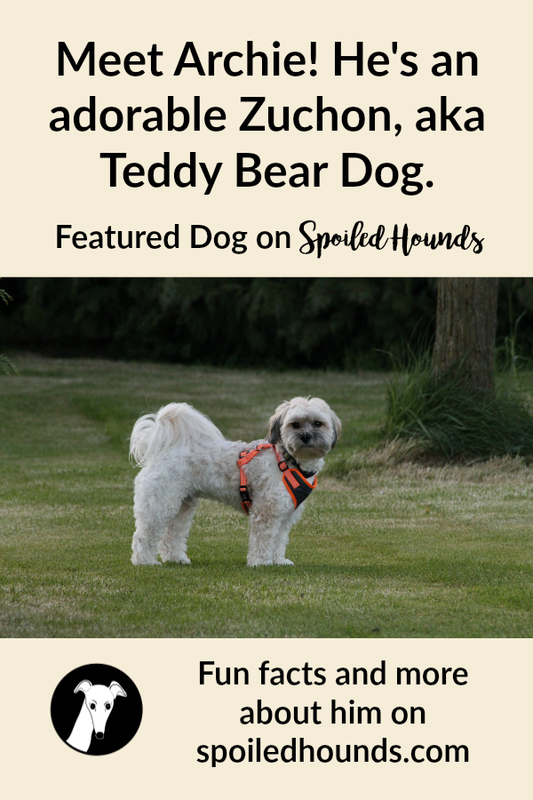 Would you like to have your dog featured? It’s easy to do. Just fill out the Featured Hounds Interview Form and email photos. We have 2 teddies and a mini toy Yorkie Poo. I never had a dog this small and it is a challenge every day. Her name is Bella Jean. I got her on 12-19-18. She was born 10-13-18. You would think Bella would be afraid of the her sisters. They are small girls but bigger then Bella. My 6 yr old is a Toy Rag Doll. Her name is Izzie.She was gotten so our 11yr old had a play mate. Her name was Sasha. It broke our hearts when she past almost a year ago. The second girl is just like Sasha. Her name is Lexiann. Shes just 1yr old. Bella is special, I always had a reason to my girls. In Bellas case I had always wanted a teacup but saw her and just fell with her. Bella is a pistal. There isn’t a day that goes by that she doesnt make me smile and she always if I’m down she picks me up. I never see myself without her being here. What a great family you have Nan! It’s so great when they give you a reason to smile every single day. And so interesting about the different personalities. 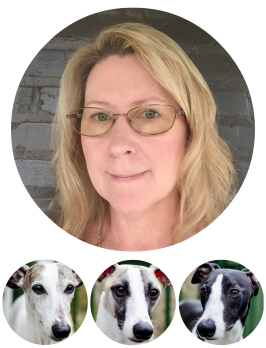 The same is with my trio of whippets. All different and almost the opposite of the trio I had before them.